At Canine Aquafitness & Veterinary Rehab Centre, our “pack” is dedicated to supporting the rehabilitative needs of your pet so you can enjoy a happy and healthy life together. We’re all passionate about our furry friends and invite you to learn a little more about us! Upon graduating from the University of Veterinary Medicine of Bologna, Italy in 1998, Dr. Catherine was offered a position with the prestigious CIRAD, a French veterinary agricultural research centre. She declined to follow her passion for animal rehabilitation and undertook more education in veterinary physical therapy. After spending several months in Germany at Vierbeiner Reha-Zentrum, an outstanding veterinary teaching hospital for physical rehabilitation, she went to the University of Tennessee where she completed the canine rehabilitation program. Dr. Catherine is an American Certified Animal Chiropractor, and a member of the Canadian Veterinary Medical Association, the Alberta Veterinary Medical Association, the Calgary Veterinary Medicine Association, the American Veterinary Chiropractic Association, and the International Association for Veterinary Rehabilitation and Physical Therapy. Dr. Catherine is also the co-founder of The Guinniss Foundation, a non profit organization which provides assistance and support to those who have pets with terminal illness. After traveling all over the world, she found her home in the beautiful town of Okotoks where she opened Canine Aquafitness & Veterinary Rehab Centre in 2013. 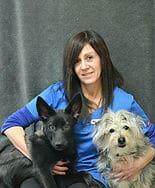 Her clinic offers a unique, caring atmosphere where pets and clients are treated like family. Dr. Catherine, who has more than 15 years of experience in physical rehab, proudly offers her furry patients all the treatments available in human physiotherapy as well as chiropractic treatments and aqua therapy (underwater treadmill). Dr. Catherine can’t really say that she has much spare time as she is very committed to her furry patients, her own two dogs, several fish and her teenager son! Life is busy at Pampiglione casa! Megan joined Canine Aquafitness in November 2017 and has always had a special interest in rehabilitation therapies. She graduated from the Animal Health Technology program at Olds College in 2015. Before this, Megan completed the Veterinary Medical Receptionist program at Olds College in 2013. During the summer of 2017 she also completed level one Reiki course and attended classes for canine massage in California through Ojai School of Canine Massage. 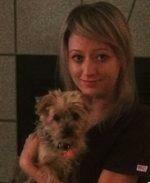 In her spare time Megan enjoys doing yoga and taking her Yorkie, Mya, for hikes in the mountains. Austin graduated Robertson College with a Veterinary Office and Technical Assistant diploma. She first got to know Canine Aquafitness & Veterinary Rehab Centre through a job shadow experience and says she loved every minute of it. This led to regular volunteering and then a position as part of our team! Austin says that her time at the clinic is enabling her to expand her knowledge and skills. Kim was born and raised in northern British Columbia, but has been in the Calgary area for about 8 years. She’s married to her best friend Quentin and is mom to her 3 boys, Spencer, 17, Landon, 15, and her furry boy Bexley who is a 5 year old Schnoodle from Kentucky. Kim joined the Canine Aquafitness Clinic in July of 2018. She has past experience in various aspects of office administration and looks forward to helping the clinic run smoothly and to serving the many wonderful patients that visit. She loves spending time with her family, her church, taking Bexley for walks, teaching and playing piano, cooking, and knitting. Micheal has grown up having a variety of pets. This has encouraged him to want to work with animals. He started volunteering at Canine Aquafitness in 2013 and is now part of the team. He has two amazing dogs, Sacus and Numa. Sacus is a handsome, mellow senior who has had an adventorous life! 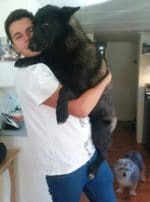 Numa is a beautiful wolf dog who is still growing and learning. She is quite mischevious which makes her the perfect fit for his family. Volunteers are an important part of our team. If you are aspiring to a career in the veterinary field or simply have a passion for working with animals, we would love to hear from you! You can connect with us by completing our Volunteer Form. Currently volunteering with us Julie, who wants to become a veterinarian. She is presently completing her Bachelor of Science, Neuroscience degree at the University of Lethbridge. She volunteers with us whenever she is back home in Calgary.